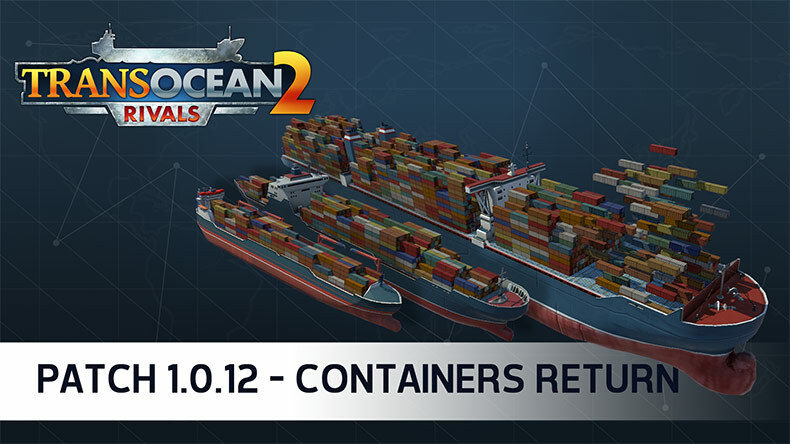 the latest update for TransOcean 2: Rivals just set sail today! Next to extensive balancing adjustments, which make the game's endless game even more challenging, the update offers you the possibility to configure many values in the endless game mode by yourself. With this you will get the unique opportunity to tailor the game according to your individual wishes and needs. 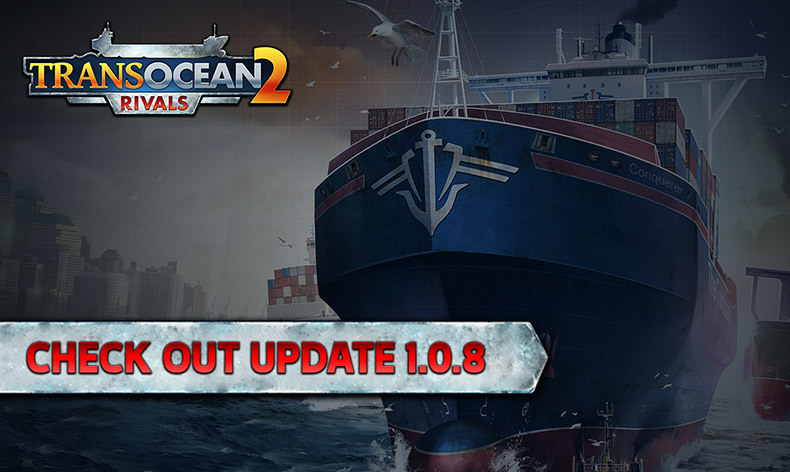 Good news: Our latest update to version 1.1 for "TransOcean 2: Rivals" is now available. Next to numerous and exciting company contracts it also includes a whole new full automation feature for your fleet. We hope you will enjoy it! Endless Mode now has a new menu for company contracts. Opening it the first time brings up a short guide to using it. You can also access these instructions at any time via the ? icon at the top of the company contract menu. As always, [F1] displays an additional menu help window. Company contracts are about entering into a long-term relationship with a company, thereby securing the transport of large volumes of cargo from A to B. This must be completed within the contract period, which means more ships are needed to meet the company contract. New company contracts are available on the first of each month, but only in regions in which you have at least one subsidiary. No subsidiaries, no company contracts! How automation works: You can accept multiple company contracts and join them together to create a route. You can assign as many ships as you want to the route. They will then travel it, automatically fulfilling all company contracts along it. These ships can also be automatically repaired as long as at least one company contract destination has a Repair Dock. Profit shares from tugboat companies have been slightly reduced. Profit shares from refineries have been increased. 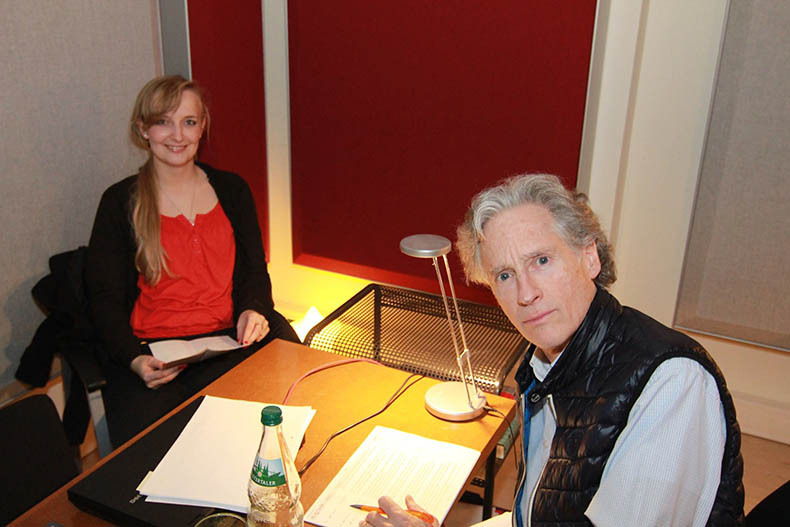 A subsidiary now only generates €50,000 a week in Endless Mode. The Donate button for donating money in Competition Mode is now correctly grayed out when your account is frozen. 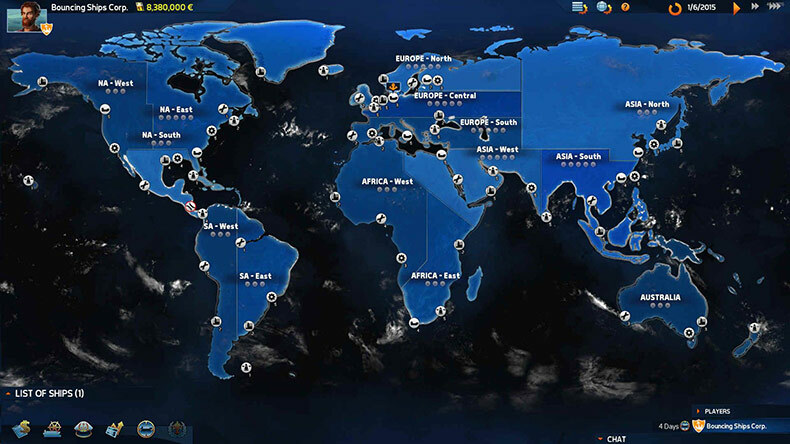 When selecting a ship’s destination in the World Map, the ship’s range is updated directly after refueling. The correct business owner is now always displayed in sabotaged wharfs. If you sabotage a wharf, the Buy button correctly unlocks if you are able to pay the reduced price. In the contracts list, it is now possible to scroll the dropdown list of anchored ships (with the mouse wheel or by dragging with the left mouse button). In the "Game" options menu you can find a new checkbox called "Show cruise-evaluations". It refers to the newsticker messages about incoming vessels, that are shown on the left side of the screen. The checkbox offers the opportunity to deactivate all these messages for all game modes (except for the campaign). our latest update for TransOcean 2: Rivals is now available for download on Steam! Next to bug fixes, a fix for users of Radeon graphics cards as well as further game improvements it also offers a frequently desired feature: visible container loads! Cargo is now graphically displayed on containerships. The game can now be played using a 21:9 resolution. However, not the whole screen will be used so there will be black bars on the left- and right-hand side. Now, the newsticker messages regarding repairs and upgrades close automatically as soon as the relevant messages have become obsolete or irrelevant. The shipping company comparison is now also displayed correctly when there are no AI opponents. A ships destination remains in effect even if it is being refueled after the destination has been chosen. Several user interface issues have been fixed. A bug that allowed ships to be bought in ports lacking a shipyard has been fixed. An incompatibility of graphic cards using an AMD Radeon 380 chipset has been resolved. The zoom settings of the mini game no longer influence the zoom level of the world map. When the tutorial is being cancelled the corresponding voice output will also fade out. Multiplayer: The icon animations are now played correctly in the whole game. Multiplayer: It now no longer happens that there are no starting ships available at the beginning of a match. Good news! We have just released the latest update for TransOcean 2: Rivals. Next to bug fixes it for sure also offers numerous game improvements - like optimizations of the auto-pause feature and the reach of the contraband scanner for example. Some more improvements to the pause function have been implemented. Automated ships now commence their journey correctly after loading a saved game. In the endless game mode ships no longer remain stuck after casting off. After a subsidiary has been bribed, its correct (sabotaging) owner is now indicated as such. The reach of the upgrade “Contraband scanner“ has been fixed, which results in less found contraband alerts. A bug has been fixed which often resulted in the wrong length of the ship parameter’s orange bars in the wharf. If you repair a ship via the contract list, you will only be able to load the ship with cargo once more after the repair has been completed. You cannot skip while naming a ship any longer. The contract sizes for class 2 container ships have been reduced so that the little “Mustang II” has a bigger choice range. In the voyage evaluation menu the wear and tear is now correctly calculated on basis of the local repair dock. It is no longer possible to sabotage yourself. If a sabotage action is cancelled, the game is no longer paused but keeps running. The current ship name instead of the model name is now shown in den upgrade dock. Several localization bugs have been fixed. The game now pauses during manual docking and casting off in the ports. The correct remaining time of the strike is now shown after the mini game has been cancelled while still in progress. The tutorial could not be continued in some cases. This problem has been fixed. While we are already working on the next update for TransOcean 2: Rivals we have prepared a little surprise for you on our official website for the game. In the artwork section of the page you can download a factful world map for the game. 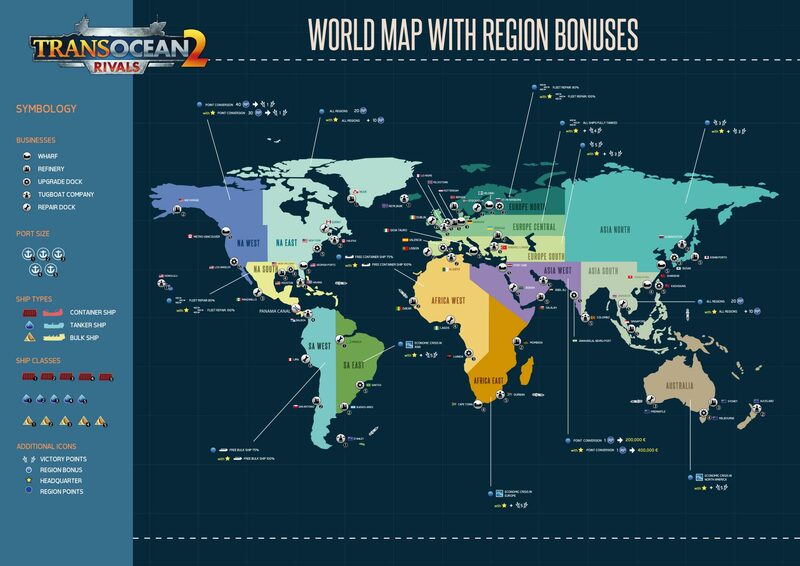 The map not only shows all harbors and regions but also offers information about what boni are waiting for you in each of the regions, what ships will fit into a harbor, what subsidiaries can be build etc. 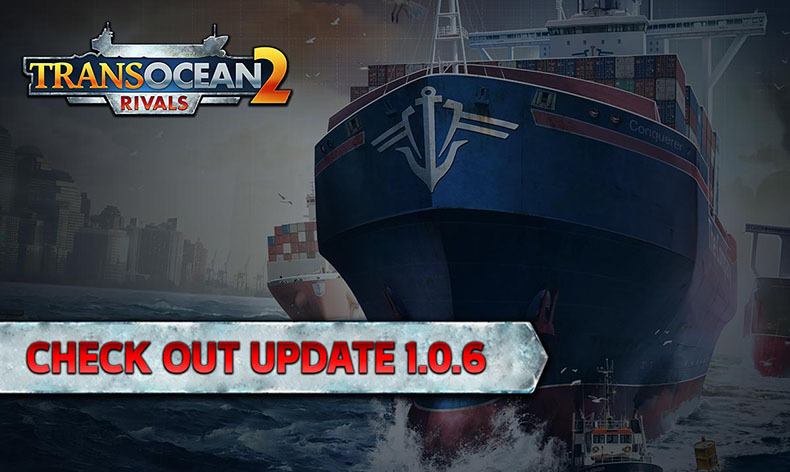 since many players expressed the desire for an option in the single-player mode that will grant them more time for planning their next moves or tactical maneuvers we are very happy to respond to this wish today by publishing a first major update for TransOcean 2: Rivals. In addition to some other improvements regarding the gameplay the much desired option to pause the game will be implemented with this patch! It is now possible to pause the game in the single-player modes, if the player wishes to do so. The pause function is now enabled by default. It is possible to enable and disable this function anytime during a running game in the options menu. As soon as a ship reaches a port. When you enter the port screen. While you look at ships in the wharf or browse for upgrades in the upgrade dock. Every time a menu such as the contract list, the ship report, the cash flow or the victory point statistic is opened. When as ship has been repaired. When a ship has been upgraded. While a direct destination of a ship is being selected via the world map. The victory point screen now shows if victory points have been earned through the unlocking of region bonuses. The frame rate has been limited to maximum 120 fps (frames per second). The limit of the maximum vertical screen resolution of 1200p has been removed. The original resolution of the graphic elements is still 1080p. The ship’s wear and tear has been slightly minimized. AI improvements have been implemented. It was not possible to use the help function by pressing the key “H” while the ship list was closed. A rare calculation error of the repair costs has been fixed. Several localization and text problems have been fixed. The performance while scrolling longer lists has been optimized. Excessive fuel consumption could result in a negative fuel gauge. The world map zoom did sometimes not reset properly. A possible display problem of the ship selection has been fixed. Rare button or menu malfunctions as well as overlapping menus have been removed. Faulty victory point calculations have been corrected. A bug which resulted in a game freeze due to a certain combination of actions, quests and game length has been fixed. The direction of the mouse wheel during the creation of a profile has been corrected. 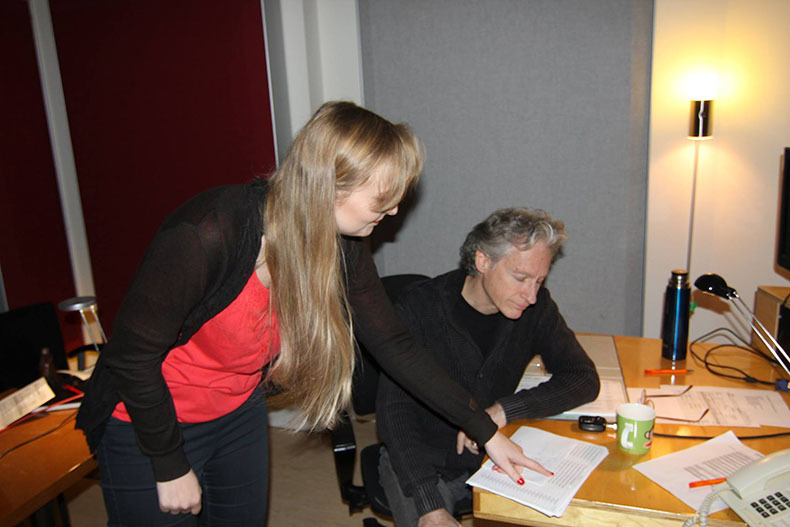 The third goal of chapter 3 is now being evaluated correctly. In certain circumstances it was not possible to select the destination port during the tutorial of chapter 4. In chapter 5 it was possible to put an offer on Lydia Blithe-Smith’s shipping company even with a frozen bank account. If a player changed his name inside the „room“, a copy of the profile could appear in the lobby. A bug has been fixed that in some cases prevented the end of a game. A bug which could cause the AI to go inactive has been fixed. The AI now attempts to fulfill quest goals with more fervor. Enemy vessels now appear red on the mini-map. The player’s ship is white. Light reflections in the mini game have been improved. 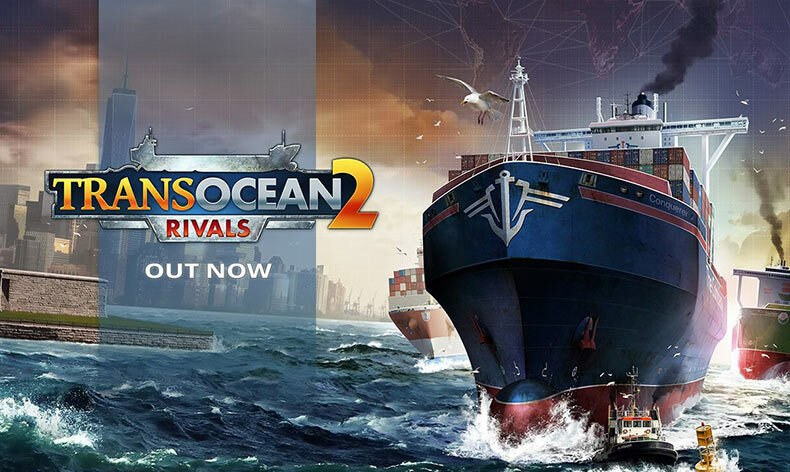 TransOcean 2: Rivals - Out now! The official release of TransOcean 2: Rivals is near. In our fifth tutorial we show you how to defeat your rivals tactically with the help of region majorities! German games magazine GameStar got behind the rudder together with Andrea of the Deck13 Hamburg developer team to take a closer look into TransOcean 2: Rivals during an extensive game session. You can see the resulting video on gamestar.de. Although it is available in German only, we still hope you will enjoy watching! 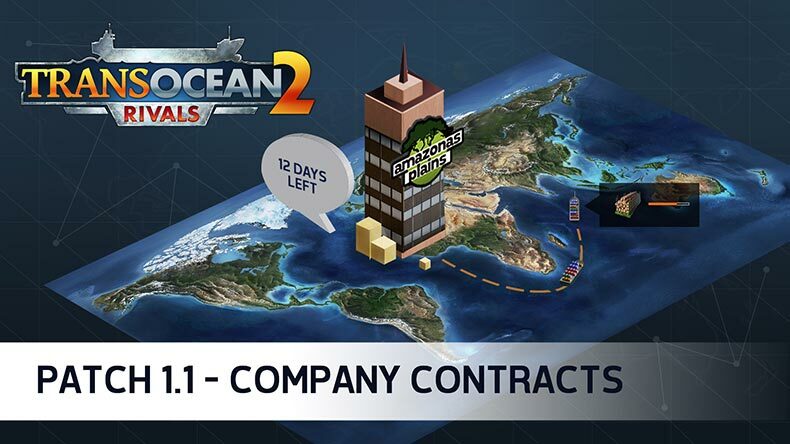 Our fourth tutorial for TransOcean 2: Rivals has been set to sea. This time we'll show you everything connected to shipyards, ships and their upgrades. So, cast off and straight into the video! In our second Developer Diary for TransOcean 2: Rivals the Deck13 Hamburg developer team offers some deeper insights into the ideas, the basics and the technique behind the exciting multiplayer mode of the game. So take the helm and move straight into the video! In our third tutorial for TransOcean 2: Rivals we give you some deeper insights into the multiplayer mode of the game. So, cast off and challenge your rivals to an exciting competition! 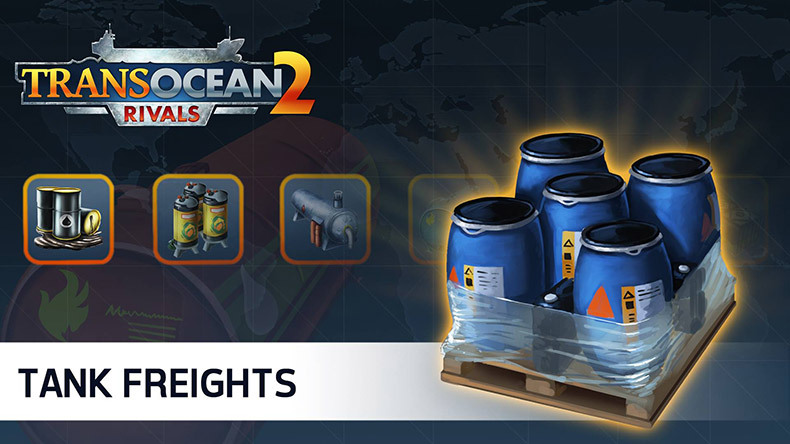 In addition to the freight upgrades there are of course also numerous other upgrade options for your fleet available in TransOcean 2: Rivals. You can use them to improve the performance of your ships as well as to secure other benefits for your fleet. Each of your ships will offer three upgrade slots and for each of these slots you will have to choose between two possible improvements. To upgrade a ship you'll have to visit a harbor that is equipped with a special upgrade dock. If the nearest upgrade dock is already possessed by a competitor, you are free to decide whether you prefer to set sail to another one, or to secure an upgrade dock for yourself to save money in the long term. n our series on the various cargo types of TransOcean 2: Rivals we today we dedicate ourselves to the tankers. Tankers can be used to ship liquids of all kinds. For example: crude oil, diesel and beverages. For the transport of animal oils and hazardous materials such as LPG, kerosene or liquid chemicals you have to equip your ships with special upgrades or transport licenses. 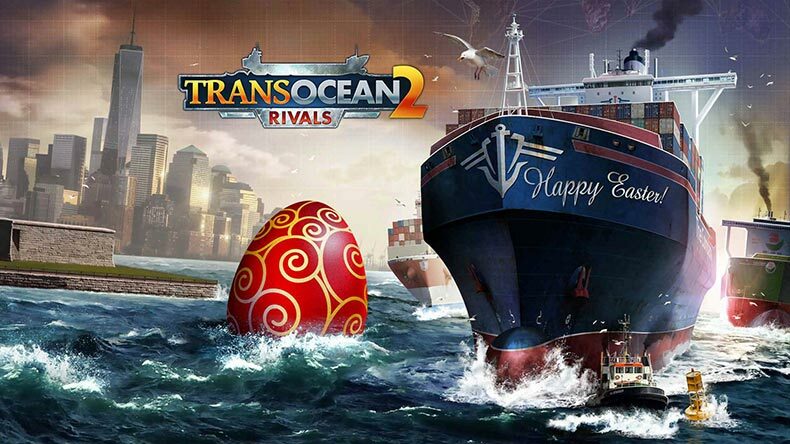 The TransOcean 2: Rivals team wishes you a HAPPY EASTER! 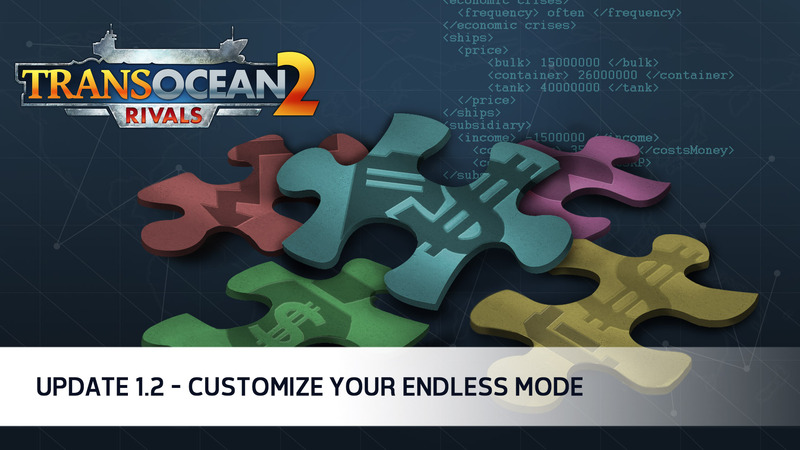 In our second tutorial video for TransOcean 2: Rivals we will show you how to navigate through the game's menus and what options are waiting for you inside of them. So hoist the anchor and move straight into the video! Good news! The main characters of TransOcean 2: Rivals will be synchronized for the first time! 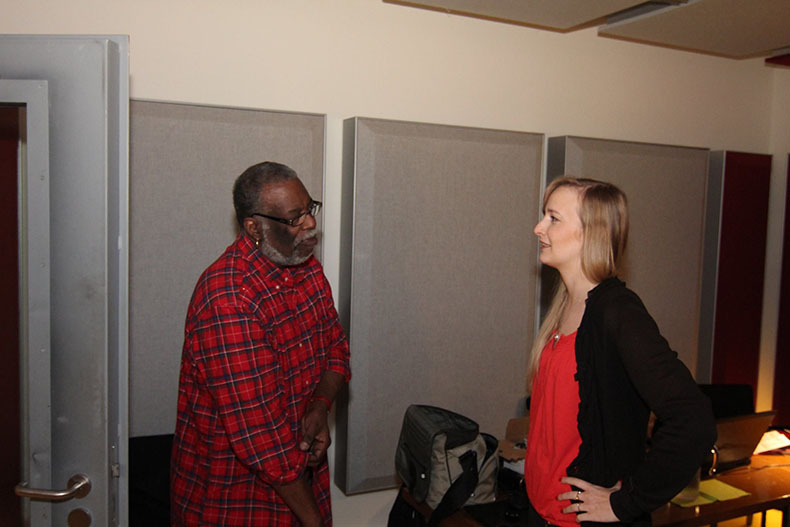 The voice recordings are already in full swing. 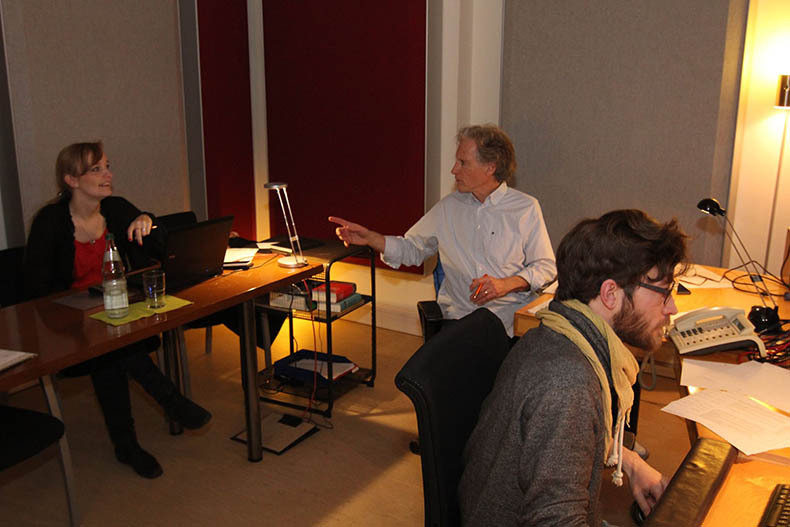 Here are some impressions of the Deck13 Hamburg devoloper team at the toneworx studios in Hamburg. 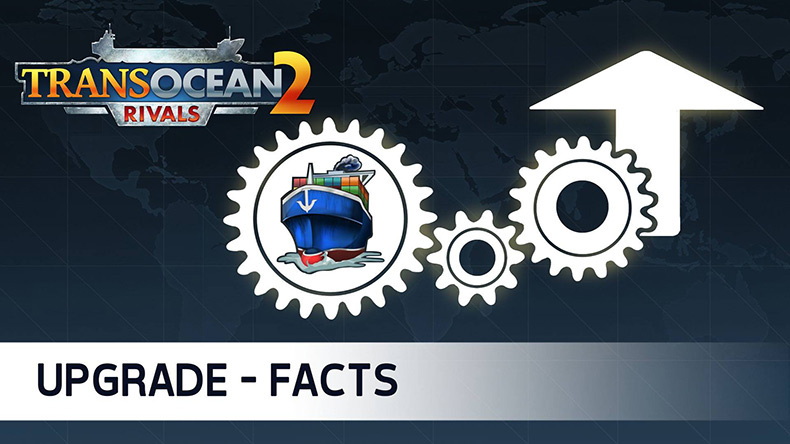 In today's tutorial video for TransOcean 2: Rivals we present first insights into the basics of the game. So put on your captain's hat and have fun watching! © 2016 Deck13 Hamburg GmbH | © 2016 astragon Entertainment GmbH | all rights reserved.